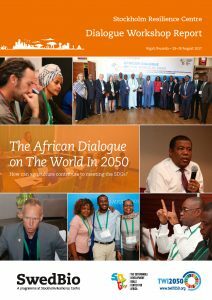 The dialogue workshop report provides a detailed account of the African Dialogue on The World In 2050 initiative (TWI2050), which was held on the 28-29 August 2017 in Kigali, Rwanda. The dialogue was hosted by the SDG Center for Africa and jointly organized with SwedBio. The event aimed at bringing together practitioners and agricultural specialists from across the African continent to explore pathways for how agriculture can contribute to meeting the SDGs, in the context of social-ecological resilience, and the conservation and sustainable use of agrobiodiversity in Africa. The two-day dialogue gathered diverse African perspectives of agriculture using SwedBio’s multi-actor dialogue methodology channelled through three sub-theme discussions: 1) Values, socio-economic development and basic human needs; 2) the resilience of Africa’s life-supporting ecological systems; and 3) governance of socially inclusive, resilient agriculture. The overall outcome from the facilitated group discussions was a diverse collection of insights and key messages that emphasized the need for continued inclusivity of local realities in current and future agricultural policy planning, the empowerment of women farmers, the integration of perceptions from local and indigenous knowledge systems into sustainable agricultural strategies, and the investment in research and education on African culture, environment, and identity. This critical information gathered from dialogue participants will be applied in TWI2050’s development and analysis of a global Sustainable Development Pathway where all SDGs are met. For more information, contact David Collste.